This article will discuss one of the important aspects of swimming: understanding the right swimming pace for you in 100m freestyle in the high aerobic range and the low aerobic range. Before we begin, we’ll try to understand what an aerobic range is, give a short explanation on the most important pulse in swimming. Is important for recuperation, warm-up, disintegration of lactic acid and release after the workout (20 beats per 10sec for people up to 45 years old, 19 beats for people 46-65 years old). Is one of the most important pulse rates for building an aerobic capability with minimum acidizing and in facts the most important pulse rate for extending the motion range in swimming and lowering the number of strokes (22 beats per 10sec, 132 per minute, for people up to 45 years old, 21 beats for people 46-65 years old). Is actually the “aerobic range” which many coaches call T3 or the Russian V2. Other coaches call it “rhythm swimming”. Most swimming practices are done in this pulse range, and this is the reason it’s so important to control it and know what your “pace” is in 100m freestyle (24-25 beats per 10sec for people up to 45 years old). Is the high aerobic range (or anaerobic) and from there on the swimmer starts to work at the edge of the lactic acid or, in other words, acidizes at a much higher rate. It’s important to note that recuperation from this pulse rate can take much longer (27 beats per 10sec for people up to 45 years old). *This article will not discuss 90%+ pulse rates and working on speed, but instead concentrate on an important workout that is a must for any swimmer at any age, and can teach you much about yourself. It’s recommended to do this workout every 3-6 months to see if your aerobic range has improved. 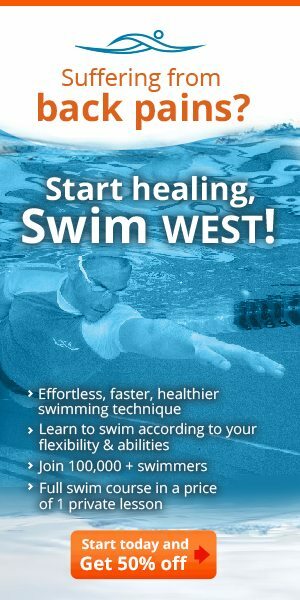 Understanding your exact time swimming freestyle in 65%, 75% and 85% pulse rates. *”Rhythm” time is measured swimming 4*100 freestyle with a 15-20 seconds break between each lap. For example: A swimmer who swims at a 144 pulse rate (24 per 10 sec) at 1:46 min, will go out at 2:05. The goal is to try to swim all four laps in similar times, and go out at 2:05 each time. 300m warm-up. Stroke count on every 4th lap Try to count strokes on the 4th lap. The number of strokes changes from day to day depending on many things like how well you slept at night or how oxygenized your muscles are. This is the time to elongate the body and breathe every 3 strokes during warm-up, even if you’re used to breathing every 2. First ___ drill Swim 4 times 50m freestyle, with 10-15 sec breaks between laps and a constant out time while maintaining the pace. Then swim another 4 times 50m freestyle in increasing pace, trying to improve your time exactly by 2 sec each lap. For Example: If you have a time of 52 sec, you out time will be 1:05. In the first 4 laps you should try to keep your time at exactly 52 sec (this is your 75%). In the next 4 laps you should try to start with 55 sec, and then go down to 53, 51 and 49. The out time remains the same – 1:05. In fact, in this drill will play a little with our aerobic range in distances shorter than 100m. 3 4*25m Swim 4 times 25m freestyle with increasing pace, out time of 45 seconds, when the objective is to maintain the same number of strokes. The goal of this drill is not to increase the number of strokes when we increase the speed. *At the last 25m you can add one stroke. If you added more than that, repeat the drill. 4 4*100m with a 15-20 sec break. preparation drill Our objective is to know exactly what’s our rhythm time for 100m, what’s our V2, our 75% capability, so that in the future we can swim long distances without acidizing our body. For example: a swimmer who swims 100m in 1:48 sec, will start at 2:05 each time, and his objective is to do all four times at the same speed. In the end, take your pulse and see that you’re not over 25 beats per 10 sec. 5 3*2*100m. One min break between sets – increasing pace. In this drill we will swim 3*100m with the same out time as before, only this time we’ll try to swim exactly 4-5 seconds faster in each lap. You probably won’t be able to make it on the first set (if you do, you’re awesome), and you will have to repeat the set. For example, your objective may be to do 1:53 sec on the first lap, 1:48 on the second and 1:43 on the third. In fact, the previous drill will dictate the time for the second lap and on. *At the end of this drill, the first lap will give you your rhythm time at 65%, the second lap will give you your rhythm time at 75% and the third lap will give you your rhythm time at 85%. 6 100m easily and then 3*100m with an out time of 10 sec less! If your out time in the previous drill was 2:05 at 100m, you are only going to swim 3*100m freestyle with an out time of 1:55/ Try to keep the same out time you had in drill 4 – 1:48. When you’re done, take your pulse, and you’ll see that if you did 1:48 like your preparing drill but with a lower out time, you’ll reach a pulse of 27-28 beats per 10 sec. *The goal of this drill is to understand that your rest time influences your pulse and the objective of the workout, and not only your swimming time. 7 300m freestyle/backstroke with fins. First lap – freestyle with very long strokes (don’t do more than 12 strokes). Second lap – relaxed backstroke. The objective of this drill is to elongate the muscles a little and disintegrate the lactic acid. This workout, that teaches you to control your aerobic ranges, is one of the most important workouts. It teaches you to be accurate in your workout goals, be precise about your times and understand that if you start your first 100m at 85% of your capability, this can ruin your whole workout.